Fiji Methodist Church leaders met with interim prime minister Frank Bainimarama today but it was less of a discussion than it was an opportunity for the military government to hammer home its gospel: Churches in Fiji have no place in politics. In a statement, Bainimarama and his government painted a picture of friendly, open and agreeable discussions saying church elders were advised to "review the leadership and refocus on their core role and responsibilities." He said the Fiji Government remains firm that the church should focus on the spiritual development of its members, and not be involved in politics. 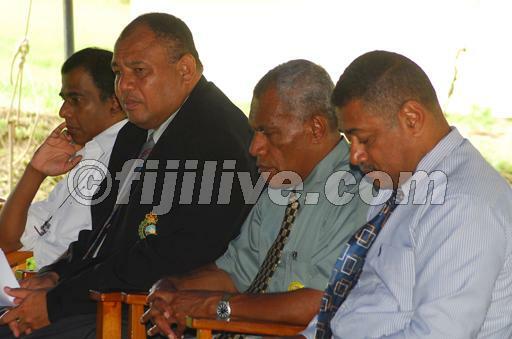 Fiji Live says the government delegation at today's meeting included the Police Commissioner Commodore Esala Teleni, the Navy Commander, Francis Kean, and senior military officers in Lieutenant Colonel, Roko Uluilakeba Mara, Lieutenant Colonel Sitiveni Qiliho and Lieutenant Colonel Leweni. The Methodist Church delegation was led by president Reverend Ame Tugaue, Rev Laisiasa Ratabacaca and all the divisional heads of the church. Also sppotted among the Methodist church delegation were Rev. Manasa Lasaro, Rev. Tuikilakila Waqairatu and Rev. Tomasi Kanailagi. Leweni says Bainimarama re-assured the elders that Government supports the church and would like to see it flourish and take on its true role of developing the spiritual foundation of its members. He said this allayed the misconception that Government is against the church. “Prime Minister Bainimarama said the Government’s concern has always been with the few leaders of the church who have been and continue to be fully engrossed with politics." Leweni was quick to make out church leaders accepted the edict of his government, saying "the meeting this morning ended cordially with more church elders and members having a better appreciation of why the annual conference, divisional and quarterly meetings have been banned." The government statement ended on this statement that revealed how well it thought it had wrapped everything up, chapter and verse: "The Prime Minister said that the Methodist Church meeting held today will be the last one allowed by Government." Bit rich that a bati ni wai such as Bainimarama accusing ministers of a conflict of interest. There's also the small matter of one fr Barr? But apparently this is ok as he's not a methodist. dis pciture says it all, a v ery unhappy and oppressed group of people. an absolute charade the declaration "the methodist church meeting today the last one allowed by the government." think of the cahtolic church, if some government was to tell vatican it has no place in worldly matters. who these military government think they are, God himself??? Not God - Bainimarama honestly believes he's following the template laid down by Ataturk. Major difference being above had popular support - didn't steal from the nation. Be no revered monolithic tomb for this bati ni wai - merely a simple headstone stating 'here lies a thief beyond belief who brought his nation nothing but grief'. Why on erath does Bainimarama need such a big group to meet the methodists? A show of power or a coward who only feels safe with gun totting idiots around him. Why cant the Church involve itself in Politic when all it's members are a member of a political Party and things around them are affected by politic? The church has a role in everything in life. It is the Big mirror we see ourselves in everyday. The air in the chuch can only smell good if the outside surrounding is clean. Church can & does involve itself in politics - ie: fr Barr. All depends on your denomination? No man has the right to be a bible teacher unless he has the message of truth and understands the great commission. These men have united with the state, the very unity that crucified our Lord. They are so far from the truth they don't know that even if they are told. There will be an excuse. The flock don't need these pack of losers. Jesus is all they need. Turn away from these men. They'll go to hell and take you with them.